This hike traverses the "bald" area of Harriman, which is a rocky area devoid of large trees which were presumably burnt during a large forest fire many years ago. It also goes through one of the most extensive iron mines in the park with numerous cuts and pits. I started on County Route 106 after it crosses the connector between Lake Kanawauke and the Little Long Pond. There is a small parking area immediately on the right side. From there took the old Hogencamp Road trail which was once a road that went through the mining village that existed here during the heyday of the Hogencamp Mine. There are still many ruins and foundations present over here. Continued along to the intersection of the Dunning Trail, where I went ahead and explored some of the upper mine workings closer to the top of the mountain, which are long cuts through the rock. 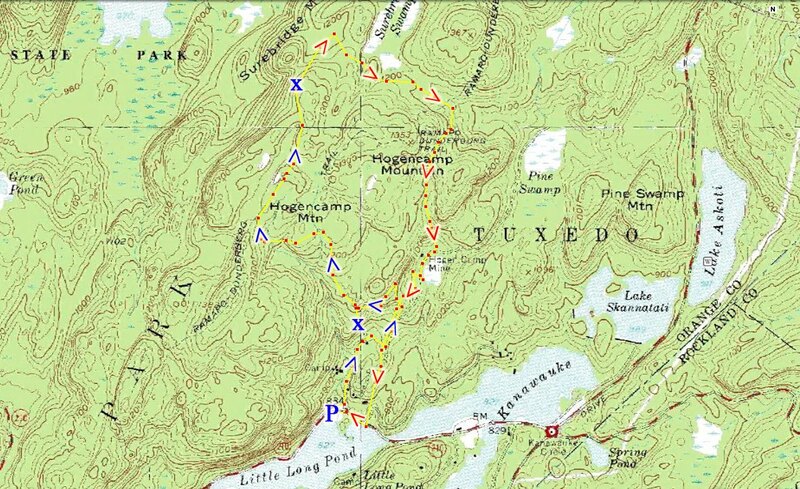 Continued along the Dunning Trail and took a short spur to the south for the view of Little LOng Pond and Tom Jones Mountain. 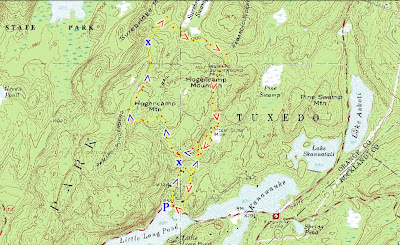 Then continued back on the Dunning past the Bowling Rocks until the Ramapo Dunderberg Trail, where I headed north and took the Lichen Trail for its entire short duration. This area is of exceptional beauty with the dense overgrowth of fern and blueberries and very limited tree cover. Towards the end of the Lichen Trail is a beautiful view of Island Pond and Sterling Forest. At the end of the Lichen Trail took the A-SB towards Times Square, a famous trail intersection, and then headed along the Long Path the Hogencamp Mine. I explored the lower pits this time and walked along the old mine dumps, and then headed along a different parallel old road trail back to Route 106 and walked from there towards the car. In one of the notches in the Hogencamp Mine. but due to the dry conditions it was totally dry. Beautiful Flora on the Lichen Trail. Island Pond from the Lichen Trail view. Looking north from the Lichen Trail right before its descent.